Team Fortress 2 has been out for ten years, and is still around—and very popular—today. 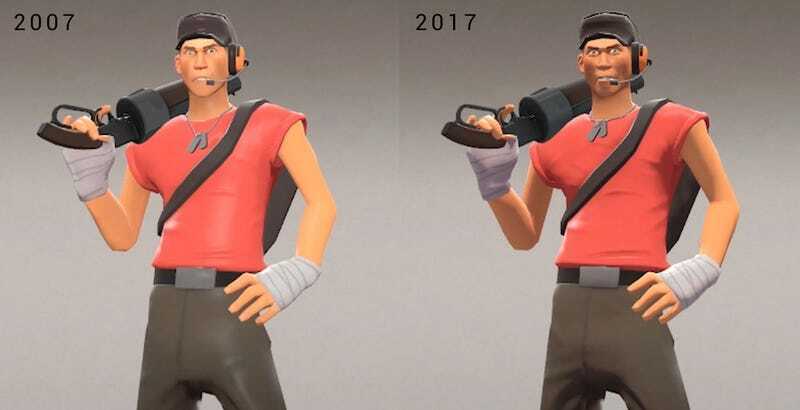 In that time you’d think that Valve would have managed to make it prettier, but as this video shows, some of TF2's visuals have actually gone backwards over the last decade. CrowbCat’s video here compares the original 2007 version of the game, preserved forever in amber on the Xbox and PS3, with the latest build on the PC. While the big stuff like the map textures are the same, notice how the lighting isn’t great, some models (big guns especially) are less complex, some animations are stiffer while others—like a revolver chamber spinning—have been cut from the game entirely. This is bad, I guess? It’s never nice when a game looks worse than it used to. But there are at least reasons for this. Team Fortress 2 has had a long and interesting run, beginning as it did as a proper video game you got in a box (or at least paid for on PC) before morphing into a free-to-play title. The game now has to cater to an incredibly diverse set of hardware configurations, not to mention accommodating a whole bunch of extra gear /hats and animations, so you can see why some corners have had to be cut in order to keep things running smoothly. You can also put most of the lighting changes down to TF2's switch to a new model a while back (and which makes some things look better!). And it’s not like the visual downgrades are hurting the game’s popularity. For a title that’s a ten years old and has been all but forgotten by the press, it still has enough devotees to be the fifth-most popular game on Steam, ahead of the likes of GTA V and Rocket League.